You'll be £12.99 closer to your next £10.00 credit when you purchase America's Commandos. What's this? America deployed a diverse group of special operations forces (SOF) throughout World War II and in Korea. These elite units quickly earned a redoubtable reputation and proved themselves adept at hit-and-run raids, gathering intelligence in long-range patrols, rescuing PoWs and living and fighting in hostile environments. This valuable, fully illustrated guide includes more than 100 rare and unusual photographs of the men, uniforms, special equipment and insignia of these elite troops. Units covered include the Marine Raider regiments and Paramarines; Ranger battalions; 'Merill's Marauders'; the Special Service Force, OSS teams; Naval CDUs; and ski and mountain troops. The United States deployed a somewhat diverse group of special operations forces throughout WW2 and in Korea. These elite units quickly earned a reputation and proved themselves adept at hit and run raids, gathering intelligence in long range patrols, rescuing prisoners of war as well as living and fighting in hostile environments. This fully illustrated card cover book – first published in 2001 – and in the series G.I. 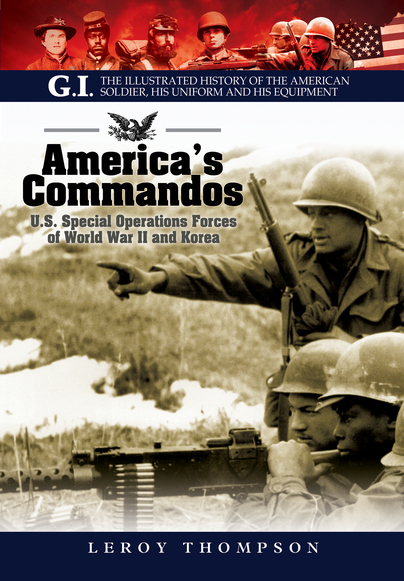 The Illustrated History of the American Soldier, His Uniform and His Equipment includes more than 100 photographs of these elite troops, their uniforms, special equipment and insignia. Units covered include the Marine raider regiments, paramarines, ranger battalions, ‘Merill’s Marauders’, the special service force, Office of Strategic Services teams, naval clearance diving units, ski and mountain troops. Leroy Thompson is one of the worlds leading authorities on special army and police units. He is the author of several books on the subject including The Bodyguard Manual, The Hostage Rescue Manual and Secret Techniques of the Elite Forces. He lives in the USA.